Thousands of prospective voters in Kansas who did not provide citizenship documents will be able to vote in the November election under a federal appeals court ruling late Friday that upheld a judge's order. The decision from the U.S. 10th Circuit Court of Appeals affirms lower court's May order forcing Kansas to register more than 20,000 voters, a number that is expected to swell to 50,000 by the time of the November elections. It noted that the preliminary injunction serves the public interest. The 10th Circuit ruled "no constitutional doubt arises" that federal law prohibits Kansas from requiring citizenship documents from people who register to vote at motor vehicle office. It added that its reasoning would be more fully explained in a forthcoming order. The court had previously refused to issue an emergency stay of U.S. District Judge Julie Robinson's order, and this latest comes after a three-judge panel heard oral arguments last month in the case. Its decision is the latest setback for Kansas Secretary of State Kris Kobach. It comes just a day after the Kansas Republican avoided contempt proceedings by striking a deal with the American Civil Liberties Union to fully register and clearly inform affected voters that they could vote in the November election. Kobach did not immediately return a cell phone message seeking comment, but his spokeswoman said his office would issue a statement later. 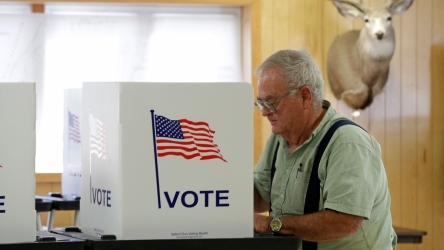 "The Court of Appeals' decision will ensure that thousands of Kansans stay on the voter rolls. It is Secretary Kobach's duty to give these voters proper notice of their rights, and to ensure that they can participate in November," Dale Ho, director of the ACLU's voting rights project, said in an emailed statement. "We hope that further court intervention will be unnecessary to ensure that he fulfills that obligation." Kobach has championed the proof-of-citizenship requirement as a way to prevent fraud by people in the country illegally. Critics contend such fraud is rare. They also say the requirement suppresses turnout because eligible citizens may not be able to immediately provide documentation such as a passport, birth certificate or naturalization papers.